Hello from the West Coast! If you follow me on Twitter at @clickflickca you would be aware that I'm in San Francisco for vacation. I've been here for a couple days already and it has been an absolute blast. I had the opportunity to visit the Twitter Headquarters which in itself is already the highlight of my trip. The folks at Twitter are extremely accommodating and a blog post on my recent visit will be scheduled in future. This is my second time visiting San Francisco. My first visit back in 2010 was courtesy of the folks at Klout. That trip was one of the best things that happen to me because it gave me the opportunity to meet my cousin that I never met before. It also triggered my foray into social media and all things social meeting people in this space and getting to meet folks from Google, Klout and Twitter. 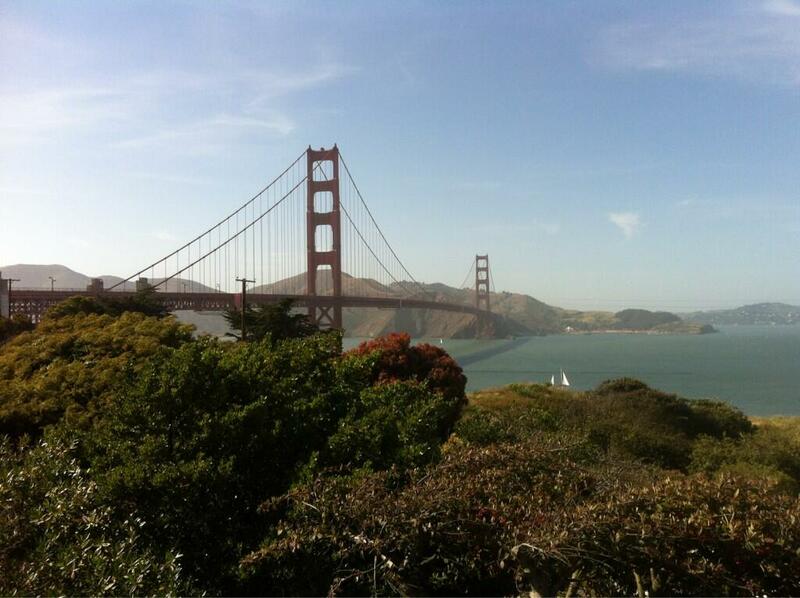 The opportunity to visit San Francisco and to enjoy all it's pleasures has been simply amazing. I had the opportunity to explore the culture and food. I recently visited the Golden State Bridge, JapanTown and now currently enroute to Napa Valley to enjoy lots of wine. At Napa Valley i'll be enjoying a visit to Benzinger Vineyard, Sterling Vineyard and a visit to Yountville. A visit will also be made to Auberge du Soleil. If you enjoyed my tweets so far i say "Thank You" for following along on my trip. Please let me know via Twitter if you've been enjoying the updates and their might be something for you. You can follow along by searching the hashtag #ClickSF and follow me on Instagram: clickflick or on Vine. I recently had the opportunity to try the NEW Pizzaburger from Boston Pizza that just released this week into their menu (Pizzaburger Launch). 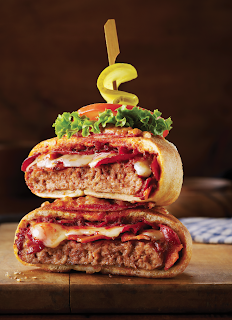 The Pizzaburger is a half pound of prime rib burger wrapped in pizza dough and comes in 2 varieties. I was able to try the Pepperoni and Bacon Pizzaburger. It definitely is a complete meal option and hits the spot. It was very juicy and quite filling. One Pizzaburger order can be shared among 2 people. 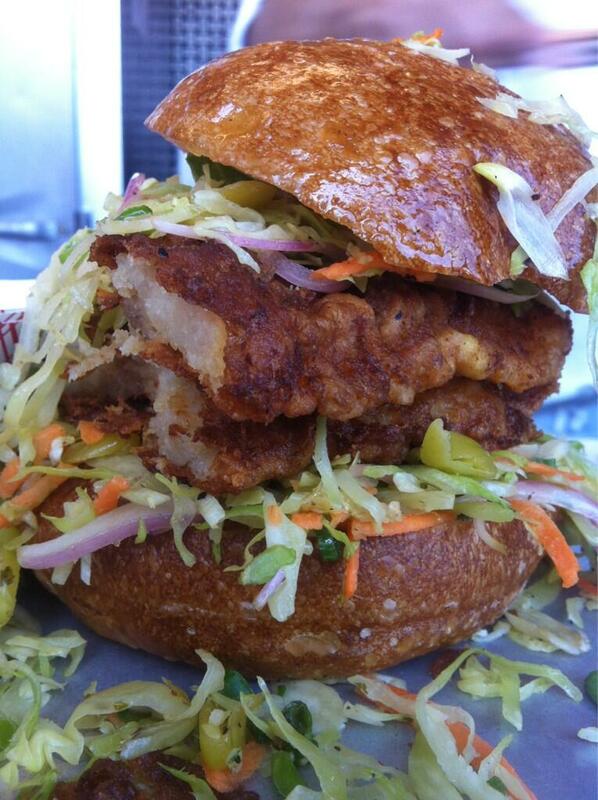 If you've got a big appetite this is your dish. Checking out the Boston Pizza menu, I was able to try other menu items as well that were just as tasty. I was able to try the Chicken wing nachos and steak bacon wrapped skewers. I enjoyed the latter of the two dishes. Overall I was impressed and surprised of the selections on the Boston Pizza menu. So would I order a Pizzaburger again? The answer would be yes. I enjoyed the food at the John st/Front st location. I recommend you visit this location. It look deceivingly small from the front of the bar/restaurant but it's quite spacious with lots of big screen tvs and quite modern looking. You'll have a greater chance to visit Boston Pizza if you join my ongoing contest below in this post. Good Luck! Disclosure: I have received compensation for this post and all opinions are my own and not reflective of Boston Pizza. I recently went on a mini road trip to Detroit to watch NCAA March Madness basketball with 2 friends and a relative. I had the opportunity to use a Chevy 2013 Equinox LT. I want to "Thank" the folks at GM Canada for making this vehicle available to me. It was a pleasure to drive on our 5 hour trip from Toronto to Detroit. It was the perfect sized vehicle for 4 guys and our carry ons, but more on that later since we decided to do some shopping! My first impression of the interior was of surprise. The leather interior with the red stitching was impressive to say the least. The type of stitching you see in higher end models of car. For most of the trip I was a back seat passenger. I felt very comfortable with enough leg room in the back. The following two photos show the leg room I had compared to when I was in the The Palace of Auburn Hills to watch the game. I felt more comfortable in an Equinox than my own arena seats at the game. My seat inside The Palace arena. Heading to The Palace to enjoy the basketball game, we coincidentally spotted the Buick Encore on display. This is another vehicle that looks beautiful and you might want to check out. After the game, we had a whole day to explore Detroit to eat and shop with the Equinox. We're able to store a lot of bags and shopping bags in the back quite efficiently with no problems. Here is the back trunk space empty before shopping. Here is the back trunk filled with all our stuff after shopping. OnStar: Press a button and get a live voice for directional help. Lane Departure Warning: A button that activates a beep warning if you're close to crossing lanes. Very nice safety feature. Backside Camera: A camera that allows you to view behind the car on the dash. Great for parking. Battery Connection behind front console: Allows me to charge my smartphone or device from back seat. Have you been to Boston Pizza before? Boston Pizza is like a Sports Bar and a restaurant all in one. Boston Pizza is about to launch something different that you haven't seen before. 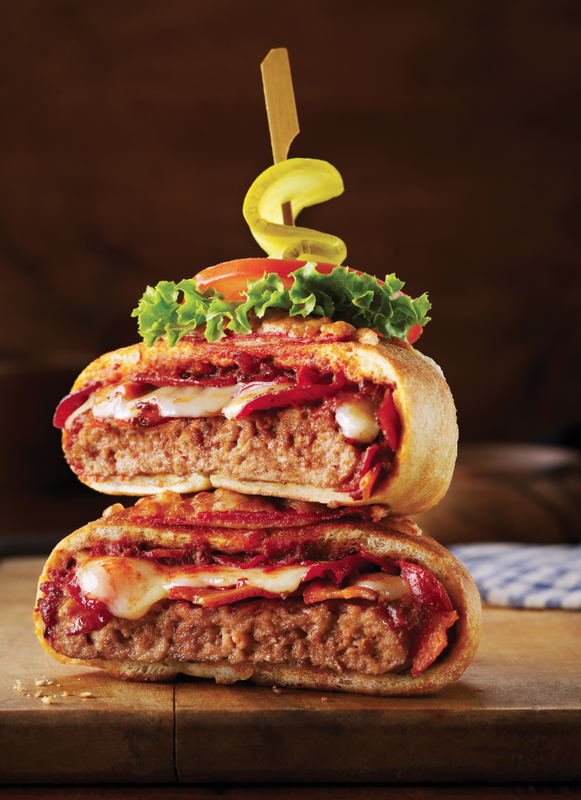 Boston Pizza is introducing the 'Pizzaburger' which is a half-pound of prime rib burger wrapped in pizza dough and baked to order. It comes in 2 varieties. Style 1: Pepperoni and bacon Pizzaburger: Half a pound of prime rib burger wrapped in a pepperoni pizza. Stuffed with bacon and mozzarella and pizza sauce and then baked. Style 2: Five-Cheese Pizzaburger: Half pound of prim rib burger wrapped in a cheese pizza. Stuffed with mozzarella, cheddar, feta, Asiago and pizza sauce and then baked. I think as you read this post your probably getting really hungry. Luckily this Pizzaburger is NOW available at Boston Pizza. You get the opportunity to try the 'Pizzaburger" combining 2 favourite food items, the pizza and the hamburger. So drop by a Boston Pizza and enjoy a Pizzaburger! 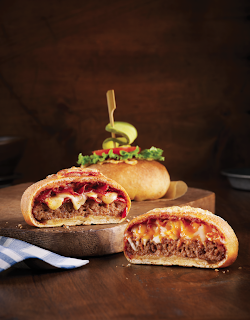 Thanks to Boston Pizza, I'll be able to give you the opportunity to try the pizzaburger by entering my Twitter giveaway for a $50 giftcard to BostonPizza.